Further details of each method can be found on the relevant page. Bristol Window Cleaning have worked hard to build an excellent reputation for supplying the highest level of service, whilst keeping our prices at a realistic and competitive level. 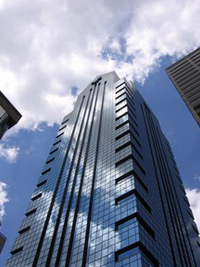 Bristol Window Cleaners are highly skilled, insured and fully trained. Bristol Window Cleaning are totally committed to the highest health and safety standards and have the very best health and safety policies and procedures in place. Carry out risk assessments of tasks and method statements. Ensure that our workforce are trained in safe working procedures. All personnel receive full induction training every year. 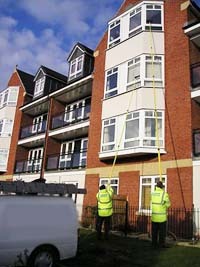 Bristol Window Cleaning provide approved equipment at all times. Comply with all relevant environmental laws and regulations. Report on the results of monitoring performance targets. According to HSE Proposals for Work at Height Regulations, the consultative document issued by the Health and Safety Commission states: "Avoid work at height so far as reasonably practicable If it is not necessary to work at height, don't. For example, it may be possible to assemble a structure on the ground and then lift it into place using the appropriate lifting equipment; or pole-cleaning systems may be used for cleaning windows so that the work can be carried out from the ground."